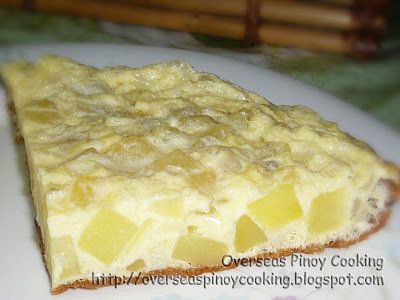 Tortang Patatas, Potato Omelet is one breakfast viand that is cheap, very filling and nutritious, it’s a common fare to most common Pinoys especially during hard times. Tortang patatas is a regular breakfast dish in our table, not that I am being frugal but it has become one of the comfort foods that I enjoy. It is best served with garlic fried rice and with patis and kalamansi dip. Potato omelet can be cook in any manner, However I wanted it cooked similar to my previous torta recipes, cooked in low heat to a cake like omelet. In a pan quickly stir fry onion, remove from pan and keep aside. Using same pan pour 1/2 cup of water and add in potatoes and simmer at medium low heat until tender and most of the liquid has evaporate. Remove from pan and place in a big bowl. Pour in the beaten eggs and mix thoroughly. Season with salt to taste. Heat oil in same frying pan, when it start to smoke lower heat to medium low heat and pour in omelet mixture, pan fry mixture for 3-5 minutes or until it solidifies, keep covered, then lower heat to low continue cooking covered for another 5-10 minutes for the inner portion of the omelet to be cooked. (Alternate way to cook the inner portion with out burning is to transfer the semi solidified omelette in tempered glassware and continue cooking in the microwave for 2-3 minutes at medium to high or bake in oven.). Serve with ketchup or sweet chilly sauce. I agree, just cover in ketchup and enjoy!